*  (1) Video pixel data handling program. It contains several examples to handle RGB and YUV data. *  (2) Audio sample data handling program. It contains several examples to handle PCM data. *  (3) H.264 stream analysis program. 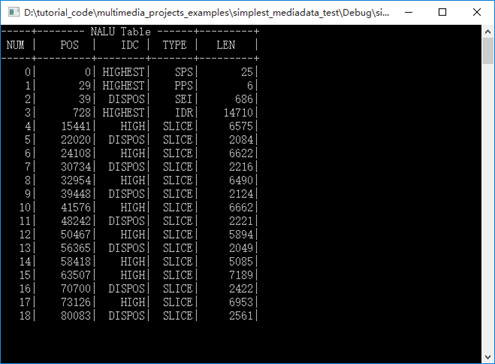 It can parse H.264 bitstream and analysis NALU of stream. *  (4) AAC stream analysis program. It can parse AAC bitstream and analysis ADTS frame of stream. *  (5) FLV format analysis program. It can analysis FLV file and extract MP3 audio stream. *  (6) UDP-RTP protocol analysis program. It can analysis UDP/RTP/MPEG-TS Packet. if(Buf!=0 || Buf!=0 || Buf !=1) return 0; //0x000001? if(Buf!=0 || Buf!=0 || Buf !=0 || Buf !=1) return 0;//0x00000001? // Here the Start code, the complete NALU, and the next start code is in the Buf. * @param url    Location of input H.264 bitstream file.